Designed for safety, the Webtool™ HP690 intensifier features a unique hydraulic circuit that automatically releases the pressure on the output side as soon as the input pressure is removed, making it safe to use for all double acting tools including the Webtool™ range of high pressure cutters and grippers. The safety features ensure that problems caused by pressure build up due to surfacing or temperature rise are eliminated. It also simplifies the operating procedures for many double acting tools, removing the need for the operator to reverse the flow before surfacing. It will also release the pressure to the tool in the case of HPU failure (dead stick). The HP690 hydraulic intensifier panel can be used with all Webtool™ cutting and gripping tools and is also compatible with third party equipment. The HP690 is suitable for double acting circuits, and contains a user adjustable pressure relief valve as well as the industry standard Minibooster intensifier with a range of pressure intensification ratios. When using a 3.2:1 intensifier, the maximum output pressure of 690 bar (10,000 psi) is achieved with an input pressure of 215 bar (3,120 psi). Integrated safety circuit ensures that pressure build up due to surfacing is eliminated. Corrosion resistant coated aluminium and stainless steel construction. Compact and robust design with pressure gauges recessed into the body for protection. Can be used at any water depth. Dual pressure gauges to show input and output pressures. Compatible with 2 port hotstabs. No additional drain port is required. Compatible with all double acting tools (including Webtool™ cutters) that require a 690 bar (10,000 psi) supply. Available in intensification ratios from 1.2:1 to 9:1. Contact us for details. 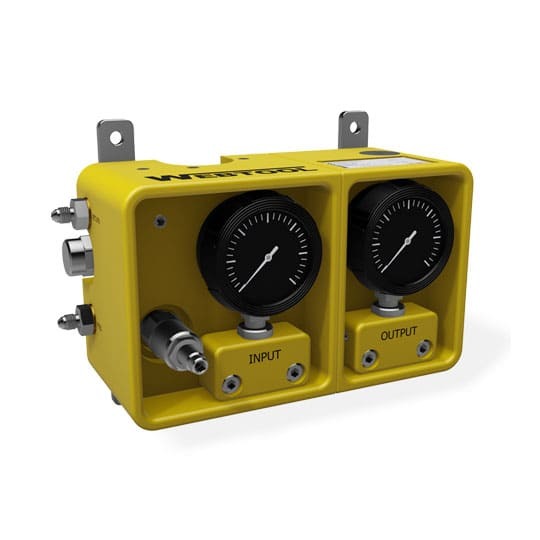 Span subsea pressure gauges fitted as standard. 4 hydraulic ports (low pressure input & return, high pressure output & return).